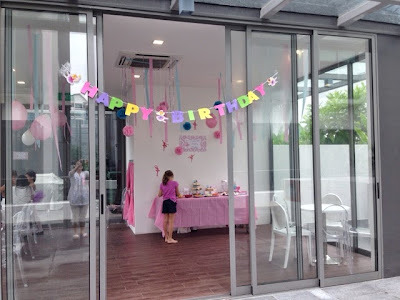 Across 2 Cultures - Cross-Culture Parenting and Lifestyle Blog: Happy 8th Birthday my ballerina! Since a year or so back, the girl became an avid ballerina who has classes three times a week and she sees herself becoming a professional dancer. 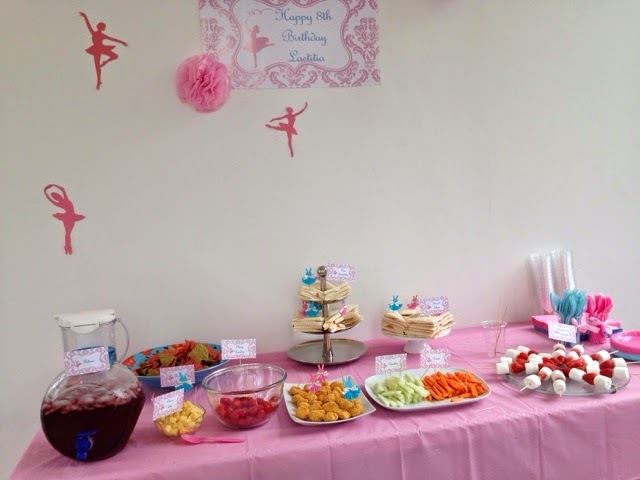 For her birthday this year, she decided that she wanted a ballerina theme party and I was secretly delighted. A pretty pink party? Sounds awesome to me! As Google is my secret best friend, I quickly turned to him for help. 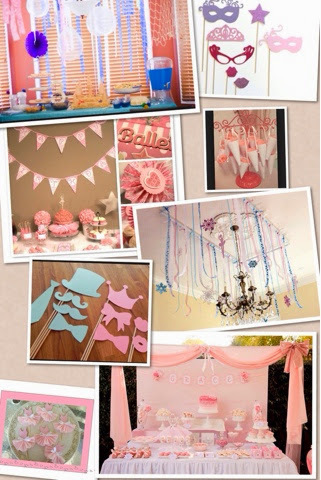 I spent a few hours looking for inspirations for a ballerina party and these were some of the ideas I loved and adapted into the party. 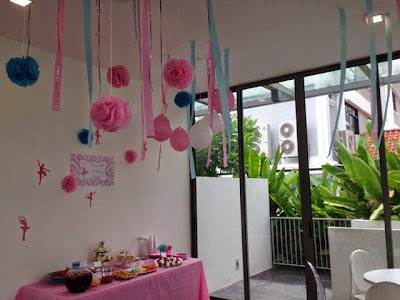 And I was happily using mostly pink in the colour scheme of the party when the girl told me that she wanted to invite one lone boy to the party! Errr.... okay, the invites were already printed but all the same, we sent them all out, nine to girls and one to a boy! With the little boy in mind, I adjusted the colour scheme to pink, blue and purple. Together with the girl, we decided that she has too many "things" and we should instead opt for donations to SPCA in lieu of presents. The girl choose SPCA as the designated charity as she love animals. And so, the actual day of the party arrived. My god-daughter agreed to help prepare some of the photo booth props and also came early to help me with the decorations and prep. Another of my niece came a bit later to help with the organisation of the party and games. My helper prepared the food. We had rather simple food as I am not a huge fan of heavily processed food. 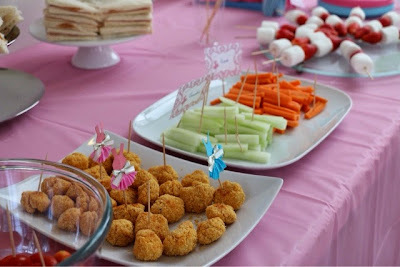 There were carrot sticks, cucumber sticks, cherry tomatoes, strawberry and marshmallow sticks, ham and cheese sandwiches, tuna sandwiches, emmental cheese cubes, chicken breast nuggets and veggie nachos. Finally, the party room is ready and the guest started arriving. We had three different activities station, a nails station to get their nails painted, a tattoo station to get some glitter tattoo done and finally a photo station to take some cutesy pictures. 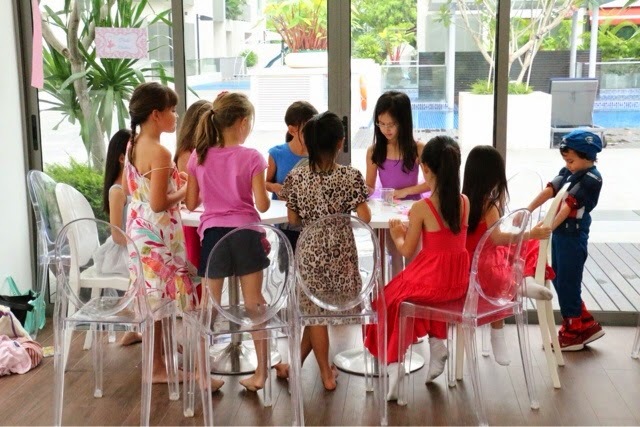 During the course of the party, the girls (the lone boy who was invited did not turn up) played musical chairs and made princess wands in between doing their nails, getting tattoos or taking Polaroid photos. The girls making the wands. 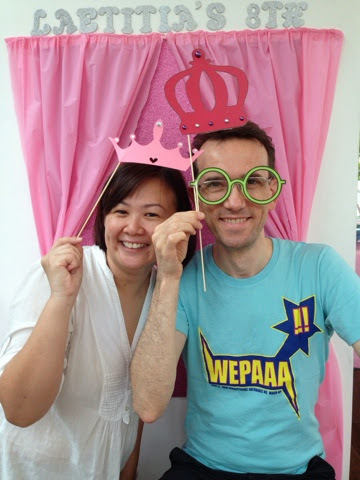 The silly parents of the birthday girl having fun at the photo station while the guests and birthday girl went for a swim (do not worry, there were adults watching the kids while they swim). The girl had a great party. She thoroughly enjoyed herself however, the little boy was feeling a bit neglected because no one played with him. I think for the next party, if it is going to be all girls, we might organise a playdate separately for the boy so that he would not feel so left out.